Festive & Easy Taco Party & Printables: Cinco de Mayo Fun! This post is a partnership with Bed Bath & Beyond. All opinions are 100% mine. Cinco de Mayo is right around the corner, and it’s the perfect day to have a FIESTA with family and friends, and eat yummy Mexican food! One of my favorite meals to host is a fun & easy Taco Party featuring a taco bar–the variety of toppings make it so there’s something for everyone. 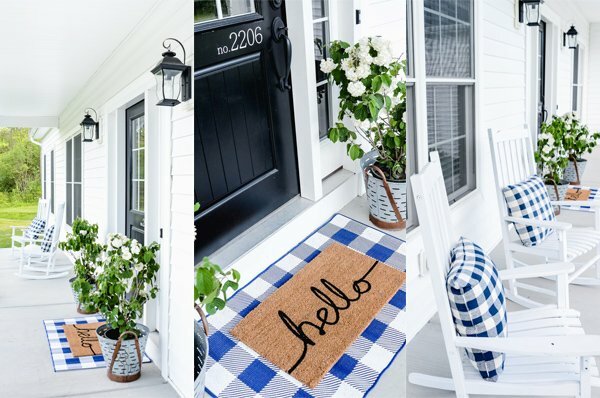 For me, simplicity is key, and I’m going to show you how I used a few favorite serving pieces and decor to put it all together! Tacos are perfect because they’re kid-friendly, and adults love them too. That means whether you’re having a party with families & kids, or just adults, a taco bar is a a great choice. I decided to do two different types of meat–a flank steak and chicken. I marinated the flank steak, then grilled it, let it rest, and cut into strips. I did the same with the chicken, but instead of a marinade, used a taco seasoning as a rub. You could also choose to do a ground beef taco if you prefer! Serving dishes are both practical and part of the tablescape decor, and I adore these bowls I found at Bed, Bath and Beyond. They’re from their Fiesta line, and the colors are perfect for a Cinco de Mayo party…and anytime! I wanted something simple to hold all of the toppings, and just the right size–not too big, not too small. I discovered these darling white souffle dishes, and they’re exactly what I was looking for. I used two different sizes–slightly larger ones for the lettuce, corn, and black beans, and the smaller sizes for cilantro, salsa, sour cream, etc. I LOVE them! I served two different tortillas for the tacos–flour and corn. I chose not to do hard shells, but can you definitely include them if you want to! I also set out a large paper back of tortilla chips, in case someone wanted to make their taco nacho-style instead. Or…to eat along with their taco! Chips and salsa are one of my favorite things ever!! Cutting boards are fun to have on the table–I like to use them as part of the tablescape, and they really are another piece that can be practical and decorative. I love galvanized serving dishes, and this darling round galvanized tray was perfect to hold the tortillas. To serve the drinks, I filled a galvanized tub with ice and bottles of lemonade and other flavored beverages. Isn’t it perfect? Easy…and adorable! We have string lights along the back of our patio, and I added some festive and colorful fans and tissue garland in bright colors. I LOVE how much it added to the overall look! All of the serveware added so much to tablescape that I didn’t need a lot of decor, but I did want just a couple of things on the table to add to the festiveness. Flowers are my favorite way to add color and texture, so I filled empty glass bottles with pink and yellow flowers I picked up at my local grocer. So simple, but so perfect! I also made a cute Taco Bar printable for the table, and placed it on a small black easel. I love having a couple of easels on hand for just this very reason! Matching food labels added so much to the overall look…I used washi tape to secure them on to toothpicks, and they worked perfectly in all the dishes. 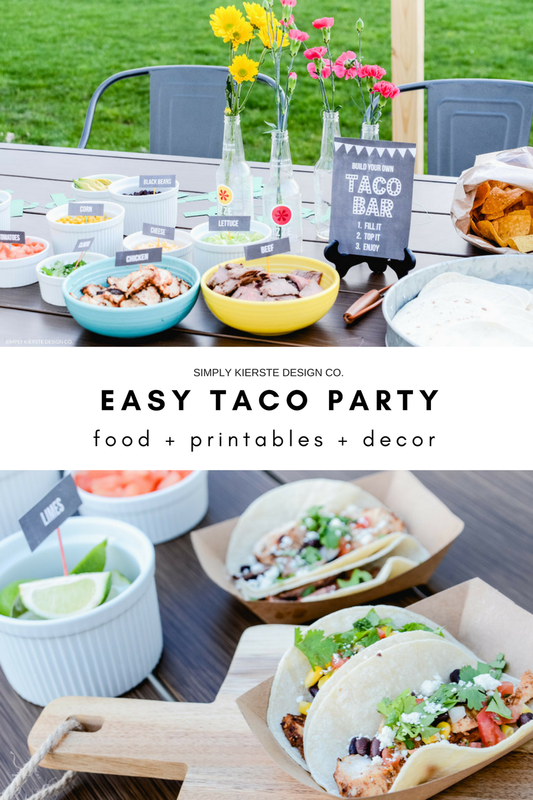 If you’d like to use the printables for your own Taco Bar, just click on the links below and save to your computer. Print, and cut! Having a Taco Party is SO much fun…yummy food, friends, and FIESTA! Looks so great! I love the flowers in the soda bottles…. I live in California so Jarritos Mexican soda is plentiful and I will use that as a vase, that is genius!